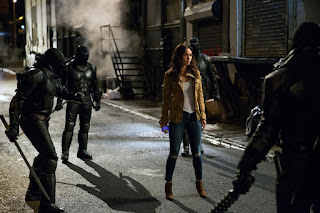 The supervillain Shredder is broken free from police custody with a teleportation device, but it unexpectedly brings him into the presence of Krang, an alien warlord bent on destroying the Earth. Krang makes a deal with Shredder that, if Shredder collects the items that will let Krang take over the Earth, Krang will help Shredder deal with his nemeses, the Teenage Mutant Ninja Turtles. Meanwhile, the Turtles have retained their anonymity; they fight crime in the city, but believe that the public would fear them if they knew of them – after all, these vigilantes are giant, anthropomorphic turtles. 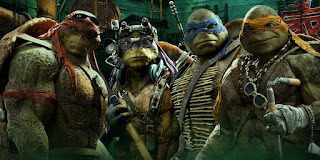 Shredder has created an ooze that can turn humans into anthropomorphic animals, and the Turtles have learned that, if they obtain the ooze, they can also use it to turn themselves into humans. Leonardo, Donatello, Raphael and Michelangelo are four teenage brother turtles who have been adopted and trained by Splinter, a rat. They view him as both their father and their sensei, and he trains them to be good ninjas and good brothers. The turtles are outsiders to society at large, but their love the city feeds their desire to be part of mainstream society – but it would be at the cost of a major part of their identity. The turtles are split on how to proceed, but eventually decide to retain their identity as turtles. Splinter encourages his sons to be loyal to each other, saying, “as long as you keep the team unified, you will always succeed.” Splinter counsels Leonardo to consider his brothers’ differing viewpoints, telling him that different points of view can make a team stronger, and that “a good leader understands it, and a good brother accepts it.” Leonardo eventually accepts Splinter’s advice, and defers a major choice to his brothers. Leonardo leads the Turtles (Donatello does machines, Raphael is cool but rude, and Michelangelo is the party dude). When Donatello tells him about the potential to become humans, Leonardo decides against it and tells Donatello not to tell the others. Michelangelo overhears this, though, and tells Raphael. Raphael is infuriated, not because of Leonardo’s decision, but because of Leonardo’s secrecy. Raphael accuses him of lying and asks him “Where’s the honor in keeping secrets from your brothers?” Leonardo’s response (it’s not lying, it’s “compartmentalization of information”) seems to only aggrieve Raphael further. 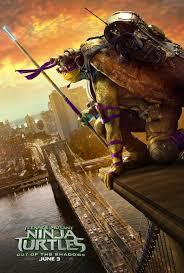 Leonardo also tells Raphael that the only vote in the family that counts is Leonardo’s. There’s a lot of action in this one but nothing stuck out as particularly scary. The film is less scary than its 2014 predecessor, so if your kids handled that one OK, this one should be fine. In generally, it seems like a good fit for ages 11-15. Have you ever felt like your siblings were your family “but not your team?” What made you feel that way? If you were one of the turtles, would you have used the ooze?